He now has a WAR of 9.1. Click here to see the leaders. Trout is tied for 94th. Actually 94th-103rd. He also is 2nd only to Babe Ruth's 1923 season in WAR per game (.0858). Click here to see that list. If Trout could get just .0429 WAR per game over the last 33 games, he would add 1.4 WAR. He would finish with 10.5. That would be the 24th highest ever. Click here to see the rookie list.. 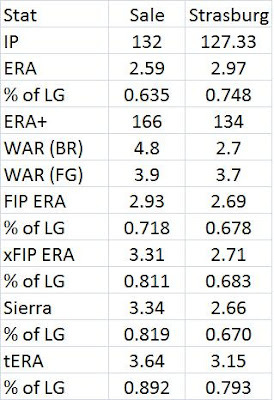 I think Joe Jackson has the previous best rookie season at a WAR of 9.0. Part 2 is below with a link to part 1. I used four stats: one for fielding, one for speed (based on triples), one for hitting for average and one for hitting for power (ISO). The four stats were multiplied by each other and I calculated their geometric mean. Players had to have 5000+ career PAs. They are relative to the league average and there is a park adjustment. I have already used both a triples stat and then a SB stat to measure speed. Here I combined them. I used the square root of the SB stat (see earlier posts for how that worked). Then that was added to the triples stat and I simply took the average of the two. One reason I took the square root of the SB stat is that it had a very large range and this brings it more in line with the other stats. This is actually similar to what Bill James does with his "speed score." One of his stats in that involves SBs and he takes the square root of it. He also uses triples. But I don't use fielding range factor, partly because it would be hard to get it for each guy but also I am already using fielding here. I don't uses CS or GIDP since we don't have them for all of history. I don't use runs scored since that depends on your teammates. So here is the top 25. Mays got a slight bumb from the park adjustment (an increase of 2%). For the above replacement level version here are the leaders (this was done the same way as in the first two posts). Mays has a solid lead. He has been the best or near the top so far in all the ways I have looked at this. To see Part 1, go to Who Was The Greatest "All-Around" Player Ever? Another Quantitative Attempt. I used four stats: one for fielding, one for speed (based on triples), one for hitting for average and one for hitting for power (ISO). There was a park adjustment, too. The four stats were multiplied by each other and I calculated their geometric mean. Players had to have 5000+ career PAs. In this case, I used a stat for stolen bases for speed instead of the one for triples. Because of that, the isolated power stat here was not adjusted for triples like I did the first time. The stolen base stat is SBs divided by number of times reaching first base (singles + walks + HBP). That was then divided by the league average. The next post I do will combine triples and SBs to make a speed stat. I think that neither a SB stat nor a triples stat are good enough by themselves. He was 8% better at fielding. His SB rate was 3.41 times the league average. 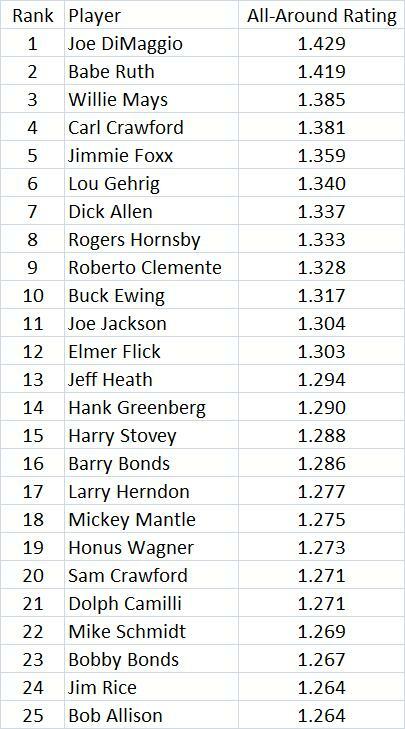 Willie Mays once again does extremely well (Bobby Bonds was 23rd before). He was 3rd in the other measure using 3Bs for speed. DiMaggio was first. But here he fell to 449th. His stealing rate was only .37. 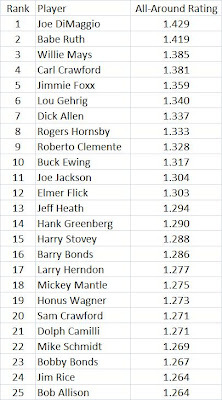 Rickey Henderson rose from 284th place since he did not have very many triples (he was just about average). So some players moved up or down in the rankings quite a bit. The SB rate had a bigger range than the SB rate (although the correlation between the two rates was about .56). It went from 5.35 down to 0.019. The triple rate ranged from 3.85 down to 0.197. I also calculated an "above replacement" level value, using the same method as last time. Here is the top 25. I don't think the number has any real meaning or interpretation. This just allows us to take into account longevity and the typical decline in performance that we normally see. Mays was 1st in this one last time. Mays probably would gain on Henderson if I could split fielding into throwing and catching (which I will try to do at some point). Would it be enough to pass Henderson? 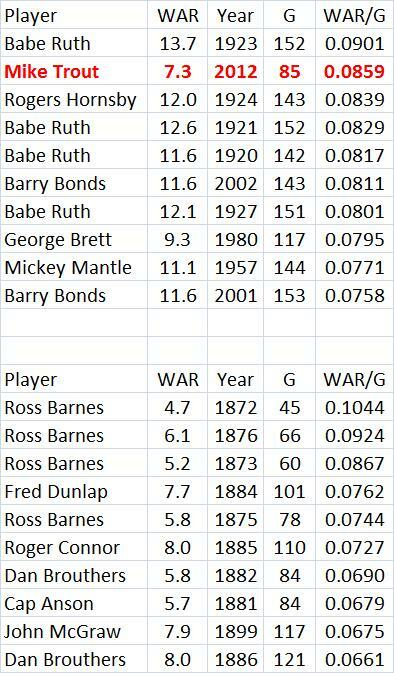 If so, I think it would strengthen the case for Mays being the greatest all around player ever since he ranks so high using either SBs or 3Bs for speed. Major League Baseball Could See Its 500,000th Error This Season! According to Baseball Reference, since 1876, there have been 499,590 errors made. So only 410 to go. With 30 teams and about 40 games left for each, there are close to 1200 games left in the season. With a rate of .5-.6 errors per game, there should be around 600 more errors this season and we will pass the 500,000 mark. There have also been 98,790 hit batters, so that could be passed in a couple of years. Update: Jose Reyes made the 500,000th error on Sept. 15th. See Marlins' Jose Reyes fumbles way into history with baseball's 500,000th error by Jeff Passan. It also has a video clip. Does Mike Trout Already Have The 2nd Highest WAR Ever For A Rookie? 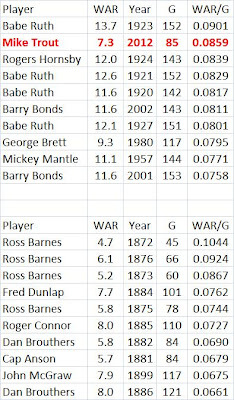 I tried to compile a list of the best rookie seasons by WAR from Baseball Reference. See my earlier post from August 1, Does Mike Trout Already Have One Of The Top Ten Rookie Seasons Ever? Trout now has a WAR of 8.6. My list would have him 2nd only to Joe Jackson in 1911 (9.0). With almost 40 games left, it seems like he will pass that. He has gained 2.0 in WAR in the last 19 games. He leads the 2nd best position player in the league, Robinson Cano, by 3.0 (Cano has 5.6). The last time a position player was 3.0 or more better for a whole season than the 2nd best position player was in 2002 when Barry Bonds had 11.6 and Jeff Kent had 6.9. Is Alexei Ramirez A Good Offensive Player? His career OPS+ is 92. His career OBP is .317 and this year it is .282. He is not making up for it with base stealing. He does have 14 SBs with only 5 CS this year. But that is of marginal importance and in his career his SB-CS is 61-32. Is Mike Trout Only The 6th Player To Have 20+ HRs and 35+ SBs In His First 100 Games Of A Season? Let me know if you think I missed anyone. Trout has a good chance to get 30+ HRs and 50+ SBs. Only two players have ever done that, Barry Bonds and Eric Davis, each once. How Much Will The Loss Of Cabrera Hurt The Giants? He has had about .043 WAR per game this year (assuming 4.5 PAs per game). So over the next 45 games, it would be 1.94. If Gregor Blanco takes over, he would get .76 WAR (he had been averaging about .017 WAR per game). So that is a loss of 1.18 wins. Of course, this is only based on this year's stats. Blanco was not in the majors last year and as of now, his career WAR per game is .01. Last year Cabrera had .026 WAR per game. It is hard to say what the real talent level of each guy is. But if I use the latter 2 numbers, it will cost the Giants .72 wins. If I average that with the 1.18, we get .95 wins. So still in the range of about one less win. Some players are said to have 5 tools: they can hit for average, hit for power, run the bases, catch the ball and throw it. It might seems simple to come up with a rating for this-you could just add, say HRs and SBs. But a player who hits 500 HRs and has 0 SBs has less "all-around" ability than a guy that hits 200 HRs and steals 200 bases. If you added HRs + SBs, the first guy looks better. So I will use a geomtric mean (Dan Levitt and Jim Baker made helpful comments-any mistakes, of course, are due solely to me). Here is what Wikipedia says about it: "A geometric mean is often used when comparing different items- finding a single "figure of merit" for these items- when each item has multiple properties that have different numeric ranges." In fact, some of the values I will be using will have much larger ranges than others. 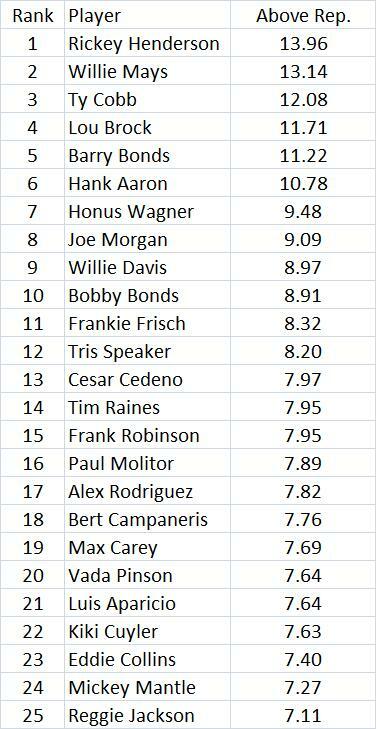 Fielding: I use FRAA from the Lee Sinins Complete Baseball Encyclopedia (fielding runs above average). Sinins got them from Michael Humphreys' recent book Wizardry. I don't have a way of easily breaking this down into throwing (arm) and catching (glove), but I have something in mind that I will use in a future post. 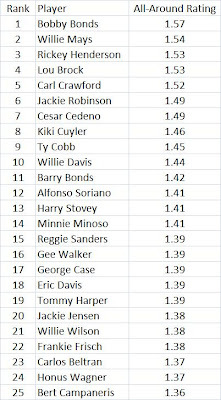 I converted it into a rate relative to the league average (like 1.10 means that you saved 10% more runs than average). 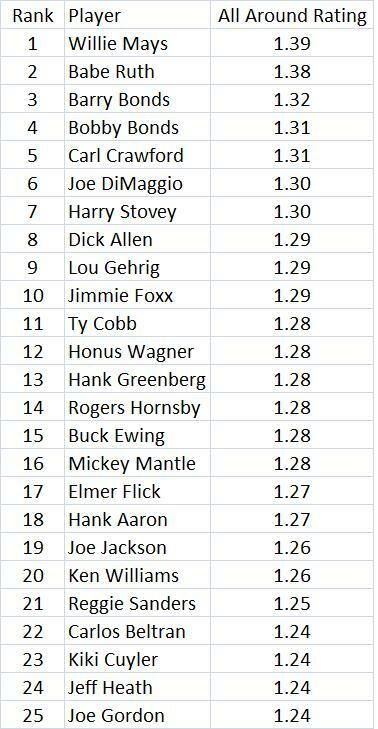 Hitting for Average: I will use average relative to the league average. 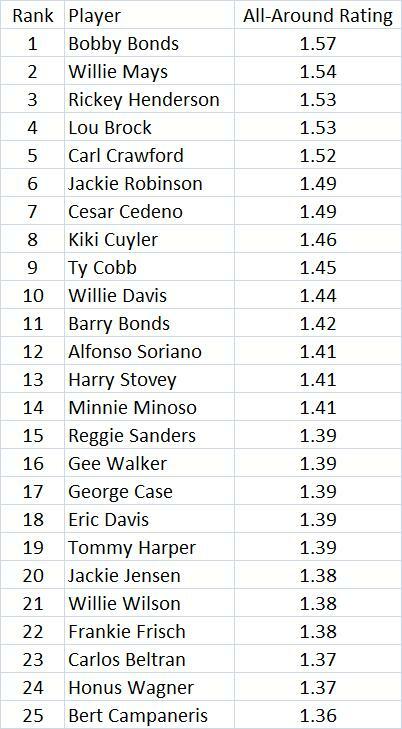 Hitting for Power: I will use isolated power relative to the league average. 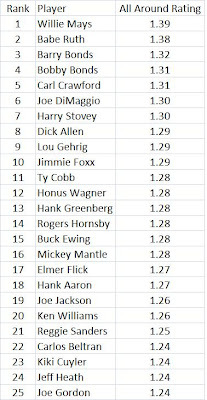 Speed: I use a player's 3B/(2B + 3B) relative to the league average. This is an idea from Voros McCracken. The idea is that it is a % of the time you hit an extra-base hit that you get a 3B. The faster players will have a higher rate here. It is relative to the league average. Handedness is adjusted for. Triples were taken out of the relative isolated power calculation (for both the player and the league average) since they get used in the speed rating. Actually, for isolated power they were considered doubles. Both the speed and power ratings had ranges far beyond those of fielding and hitting for average. A park adjustment was also made to each player's overall rating (this was based on hitting only). The four ratings, each relative to the league average, are multiplied times each other and then I take the 4th root of that number (the geometric mean). I used all players who had 5000+ PAs through 2011. The table below shows the top 25. Some players are not too surprising while others are. One possible weakness is that some players played long careers and in their later years, the averages and rates were dragged down. So I also tried to create a rating for "all-aroundness" above replacement level. If the average level would be 1.00, then replacement could be .8 (what I used). This might be reasonable because 80% of 81 is about 65 wins, an acceptable replacement level (if we want to go down to say 54 or 52 wins, we could assume that the replacement level pitchers would get you the rest of the way there-remember, these are only position players and their hitting, fielding and running). Alot of all-time greats here. But Steve Finley really jumps out as a surprise. Through yesterday's game, he had 7.3 WAR in 85 games. I found all the seasons with 7.3 or more WAR from 1901-1912 at Baseball Reference. Then ranked them by WAR per game. Trout is 2nd only to Ruth's 1923 season. Then I found the top 200 seasons in WAR from 1871-1900 and ranked them by WAR per game. The table below shows the top 10 from the two searches. Are Darwin Barney And Brendan Ryan Having Historic Fielding Seasons? Does Mike Trout Already Have One Of The Top Ten Rookie Seasons Ever? Using the Baseball Reference Play Index, I found the best seasons for anyone in their 1st, 2nd, 3rd, or 4th seasons. If a player had 130 or more career ABs before a given season, I no longer considered him a rookie (I think that is the rule and I think there is something also about days on the roster but I don't know how to find that). 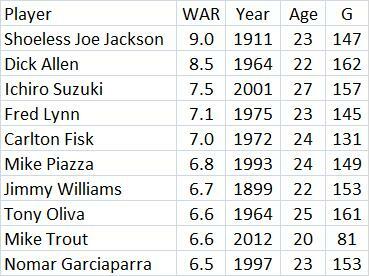 So here are what I think are the top 10 seasons ever for a rookie position player in WAR. Please let me know if you think anyone is missing. Notice how few games Trout has played, so it looks like he could pass Jackson. MJ Lloyd of HaloHangout has a good post on how Trout compares to other great 20 year old players. See Mike Trout Is In Elite Company. 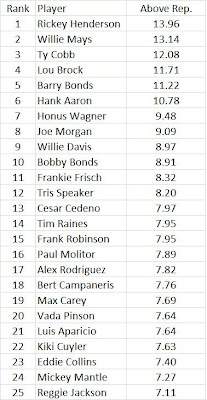 AROD has the highest with 9.2 in 1996. So Trout could break that, too.